Do You NEED To Take A Protein Shake? Are you a high performance athlete, with extremely high nutritional demands? If not then the answer is probably not. Protein and meal replacement shakes originally were designed to help athletes reach their nutritional goals when standard nutrition would prove to extremely difficult to achieve. For instance some athlete have demands in excess of 5000 calories a day and the sheer volume of food that would need to be consumed is not only expensive, but also an extremely unpleasant experience as well. All good nutritionists and dieticians would recommend Food in favour of shakes, and that shakes came about for those extreme cases when, it was either impractical or near impossible to meet certain goals effectively. This was due to whey protein shakes, providing a fast and quickly digestible source of protein, to help athletes get the protein in when they need them to help enhance muscle repair and recovery times. The average person doesn't need protein / meal replacement shakes and in fact they can to a certain degree be detrimental to your actual goals. Yes a shake can seem highly convenient, they are quick and easy to make and in theory allow us to meet certain nutrition goals with relative ease, but there is a significant flaw in this approach. 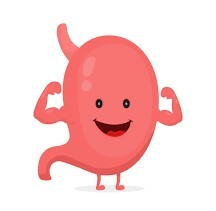 YOUR STOMACH IS A MUSCLE! your stomach is a muscle! give it a workout! In fact all our organs are a type of muscle known as “smooth” muscle and digesting food burns calories, and helps maintain a healthy metabolic rate (the speed at which your body burns calories). Eating solid food will take around 2 hours to pass through your stomach, whereas a shake which is liquid based will pass through in around 30 minutes. So ask yourself the question, which one is burning more calories in digestion and keeping your metabolism where is should be? The solid food of course! The liquid one though it may have the same equivalent calories, will have used LESS energy in digestion, which in turn can affect your metabolic rate, slowing it down, meaning you should need fewer calories, and causing your body to become catabolic consuming muscle instead of fat to access energy reserves. People often notice rapid weight loss on shakes, but this is a “false achievement” because as liquid has lubricated your intestines, the food stored in there (upto 4lbs at a time) will move through it much easier and be evacuated faster, allowing you to drop several lbs extremely quickly. This is usually accompanied by a low carb diet, which enhances this by tricking the body into losing water weight as well, (not fat). Unless you're a high end athlete you should probably steer clear of meal replacement shakes, in general it is unlikely you're calorie requirement would be high enough to warrant one. Protein shakes maybe but only AFTER a workout and this is only because you're body is primed at that point to receive the protein. The one caveat to all this however is if you find yourself desperately short of protein in your diet, you can use the protein powder that is used to make the shake, to add it to other foods that maybe used in baking as an additive or even to you're porridge oats or “PROATS” as the are popularly called once you add protein powder to porridge. This can ensure that you are getting the protein that you need, whilst also making sure you are continuing to eat solid food! Achieving the best of both worlds. Remember protein shakes were designed only to be a SUPPLEMENT to a healthy diet, never a replacement, and the “replacement” should only be really for athletes with extreme nutrient requirements.